I am not a fan of this at all. I mean the ratings say it all. 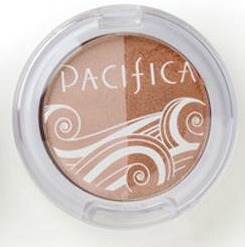 Other than the fact that there is variety I did not like anything about this eye shadow. The color was faint, it didn't stay on very long, even the case mine was in broke several times. I was overall very unimpressed. The other thing is that there is no divider between these two shades, so they mix and since they aren't very pigmented anyways, it makes the darker shade even lighter.